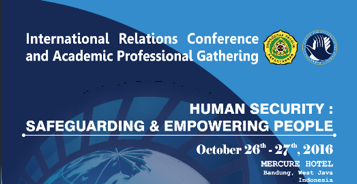 The Center for International Studies (PACIS) at Universitas Katolik Parahyangan is organizing a conference Human Security: Safeguarding and Empowering People, October 26-27, 2016, in Bandung, Indonesia. The goal of the conference is to enhance the discourse and share innovative thinking about human security among scholars, practitioners, bureaucrats, and civil society, as well as to discuss potential future cooperation initiatives around human security related issues. Call for papers deadline is June 24, 2016. Please use the poster to promote the event and submission of proposals at your universities. UNPAR is also looking for keynote speakers.